Our font, from St Andrew’s Church Gartcosh, is placed near to the entrance of our church at its west end. Looking through the doors, it is one of the first items of church furniture we see. The placing of the font is symbolic of the journey the Christian believer through life (John 3:5). For the infant, it is site of their baptismal rite, their initiation into Christ’s church. For the baptised, it is a regular reminder of our baptism. 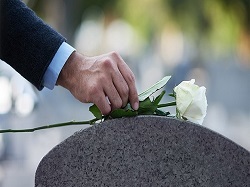 For the departed, it is the last point of their church journey as they move onward to God’s everlasting kingdom. The font we encounter weekly is one specifically designed for infant baptism. In the early history of the church it was common to baptise adults. John the Baptist baptised the adult Jesus at the start of his ministry. In many mediaeval churches, the font was in a separate Baptistery building. This was to ensure the privacy of the person receiving baptism. These buildings, often octagonal, were serious works of architecture. Many remaining examples can be found in Italy. We can see a replica of the remarkable main doors to Florence baptistery at the Hamilton Mausoleum. The word “font” is from the Latin “fons” meaning spring or fountain, a meaning that resonates with the John 4:14 text. The oldest font in Rome, at the Lateran Church from the 5th century A.D., is situated over a spring. Fonts are the vessels that hold the consecrated water. Baptisms in our church are predominantly, though not exclusively, for infants. The Priest pours or sprinkles water on the forehead. In many church traditions in the past and today, full immersion of the candidate takes place. Fonts are holy places where one of the great sacraments of the church is encountered. They are therefore protected in various ways. They could be locked in a separate baptistery building e.g. Florence, Pisa. They could be placed in a baptistery chapel within the church or cathedral. Two great twentieth century cathedrals in England – Westminster and Coventry – have this style of baptistery. Fonts will be covered at all times when not in use. In mediaeval times, apparently theft of holy water was common. The Archbishop of Canterbury decreed in 1236 that fonts should be always kept locked. I’m not sure if the Scottish Episcopal Church has canon law on that! Font covers varied in design from flat lids to tall ornamented covers with pinnacles and small buttresses.